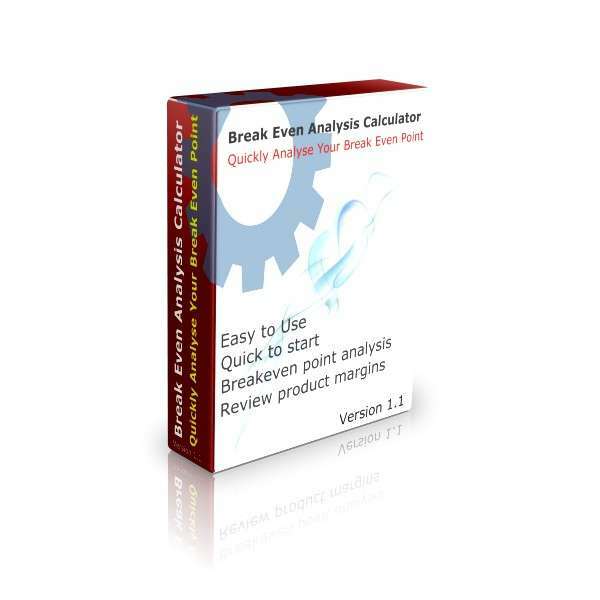 Free Break Even Analysis Calculator – A valuable free business tool for most businesses. Enter up to 100 product lines – A free business tool that can be used by small, medium and large businesses to analyse break even points. Calculate optimum sales for your products – Run as many scenarios as you like, in order to discover the best mix of product sales to achieve break-even point. See the affect of price changes on sales price – See how by changing your sales price, this affects your break even point. See the affect of price changes on cost of sales – See how by changing your cost price, this affects your break even point. What if you stop selling one of your products? Our Break Even Analysis Calculator has this function built in. See the impact on your business by taking out one of your product lines. Easy to use Excel Template based calculator – We’ve kept things simple, so you’ll be up and running in no time with this Excel based template. 1. Free Break Even Analysis Calculator. Break-even analysis is a usual component of most business plans. This is especially true for startup companies. Our Free Break Even Analysis Calculator helps you to determine your company’s break-even point. A businesses break even (or break-even) point is the point at which the business sells enough units, so that the gross profit generated by the sale of those units is equal to the total of the business’s fixed overhead costs. Or put another way, it is the point at which the business makes neither a profit nor a loss. There are different definitions of fixed overheads. One definition is where it includes those costs that the business would incur even if the business was closed down. However, to get the maximum benefit from our Break Even Analysis Calculator, we recommend that you use your average running costs instead. Your average running costs would include your payroll costs, telephone, printing and stationery, utilities etc. By using our suggest definition for your fixed overheads, you have a more realistic and meaningful break-even point for your business. Our Break Even Analysis Calculator is a valuable free business tool, which can be used by most businesses. 2. Enter up to 100 product lines. We have included up to 100 product lines in this free business tool. You’ll be able to split out each of your products, identifying the individual selling price, along with the related cost of sale for each one. If your business has a greater number of products than 100, please let us know and we will adapt the tool for you. As we include a high number of product lines, this free business tool can be used by small, medium and large businesses for break-even analyse. 3. Calculate optimum sales for your products. The number of scenarios you can run for your business utilising our free business tool is unlimited. You can run as many scenarios as you like, in order to discover the best mix of product sales to achieve break-even point for your business. Run as many what-if scenarios of the number of products you sell, together with however many product mixes, to achieve your optimal break even point. 4. See the affect of price changes on sales price. Raising or lowering your sales prices will have an impact on your break-even point, as this affects your gross profit margins. You can see how by changing your sales price, this affects your break even point, either across all products or by increase individual products…one by one. 5. See the affect of price changes on cost of sales. The amount you pay for your products, or how much it costs you to manufacture them, has a big impact on your break-even point. So this has been built into this free business tool. You will be able to see how by changing your cost price (either up or down), this affects your break even point. As with changes to your sales price, you can adjust your products costs across all product lines, or individually too. What if you stop selling one of your products? There may be products that you presently sell, which you might be better off not selling at all. You can use our Break Even Analysis Tool to review this in your business. An example of this, would be to analyse the affect of removing low margin items from your sales pipe-line. Combine this feature with changing your sales price or changing your cost price and sales quantities, and you have an extremely valuable tool to analyse your business numbers. Easy to use Excel Template based calculator. This free tool has been built using a Excel Spreadsheet and is an easy to use template. Your knowledge of Excel is not important, as it is very easy to use and comes with a quick guide on how to find your way around, and how to use the template. So as we’ve kept things simple, so you’ll be up and running in no time with this Excel based template.